When life gives you lemons, make lemonade, right? Well, life hasn’t given me lemons, but it has given me an unattractive concrete back “yard.” I’m not fond of it, but once in a while, it does work out nicely, like when the boys play basketball with their buddies and recently, when we figured out we could make it into a drive-in movie theater! As the kids get older, we’ve been shifting towards small get-togethers rather than large parties to celebrate their birthdays. Last year, we had a simple sleepover for our oldest, with pizza, cake, and a movie. 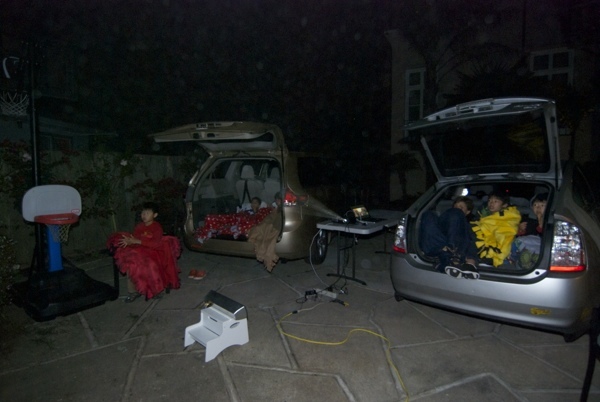 The kids had a great time, and this year, I decided to change things up by taking the movie outdoors. Here’s what you’ll need to put together your own outdoor movie night! The birthday boy settled on Kung Fu Panda 2, which was a big hit with the kids. I was pleasantly surprised myself, especially given the low expectations that come with anything that has “2” in the title. It was funny and sweet with the right amount of slapstick comedy to please our crowd. 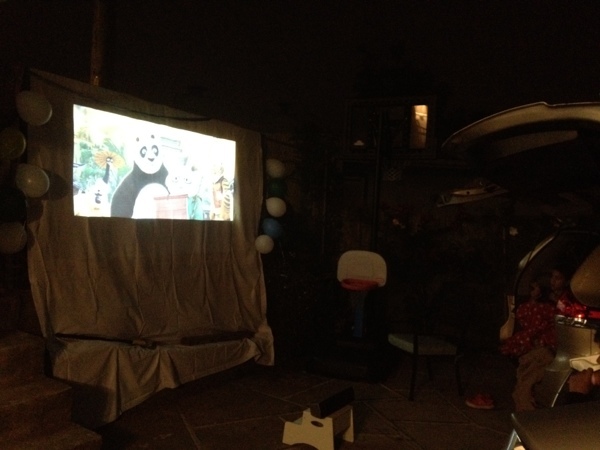 Projector: I looked into renting one, but at $100 a day, I felt we were better off buying one. We lucked out and found a lightly used projector on Craigslist for less than half the original price. I’m certainly not an expert, but I did figure out that you want lots of lumens, for brightness, and you also, if you are buying used, be sure that the bulb isn’t worn out, as these can cost $100 themselves. Screen: A butyl-coated painter’s dropcloth makes the perfect movie screen, a tip I found over at Prairie Hive. This is the 9’x12’rubber coated canvas drop cloth I found, and it worked perfectly. It’s large and white, and the plastic coating has a slight sheen that makes the movie look nice and bright. Christmas lights would look great around the screen. I tried to make glow in the dark lanterns made by tying glow bracelets inside balloons. They didn’t end up noticeably glowing, so I would recommend putting several inside each balloon to see if you have more success. The balloons themselves still looked festive, at least. We made s’mores in a cone, aka campfire cones, which I actually baked in the oven. 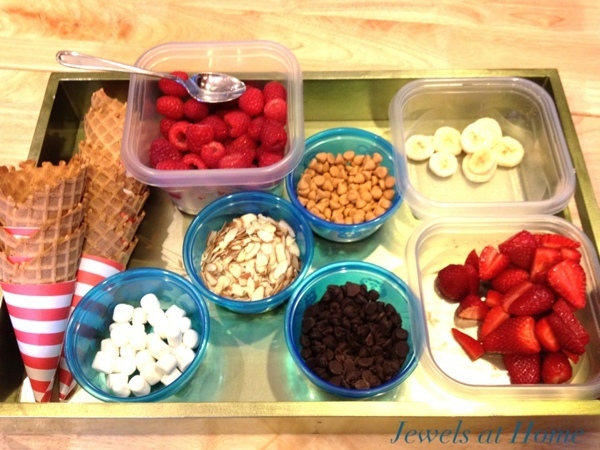 Each kid made their own mix of strawberries, raspberries, bananas, chocolate chips, marshmallows, butterscotch chips. The fruit made the cones a little soggy in spots (may be better to omit the berries and try something like apple), but the result was definitely yummy. 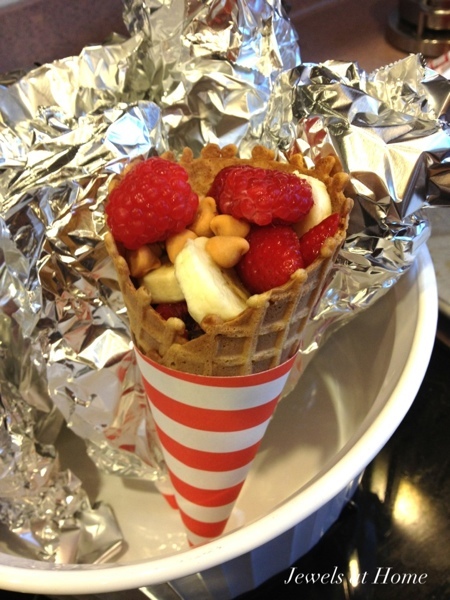 Make “s’mores in a cone” with the kids. “S’mores in a cone” ready to bake. And what movie night would be complete without popcorn? I served the popcorn in brown paper bags decorated with red scrapbook papers and “popcorn” printed, appropriately, in Broadway font. To fight the chill, we finished the evening with hot chocolate. 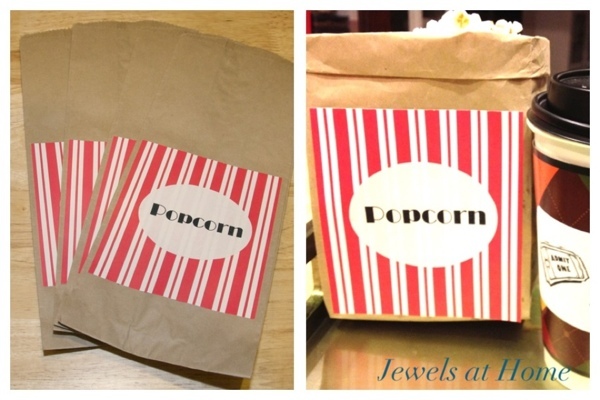 Decorate popcorn bags for a home movie night. Movie-themed labels for a home drive-in party. 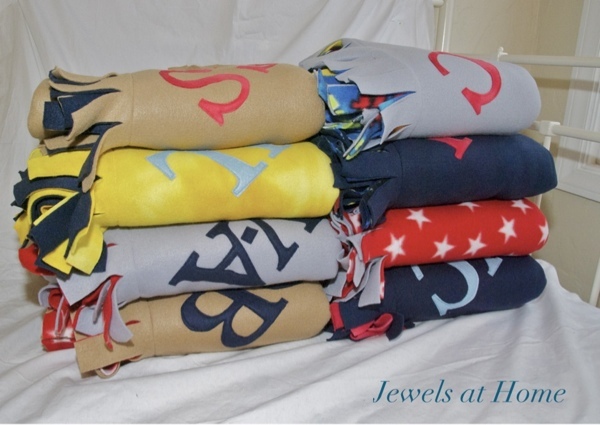 And the fleece blankets I made for the boys worked out perfectly – they kept everyone warm for the movie, and I was very gratified to see the boys curling up in them to play games and sleep, as well. And finally, a few pictures of the home drive-in party. They turned out a bit dark, but that only makes sense, right? The drive-in birthday party was such a success. We’re definitely all exhausted, but they boys had a great time and made many memories. I’m thinking we should make the drive-in a regular occurrence! Wow. 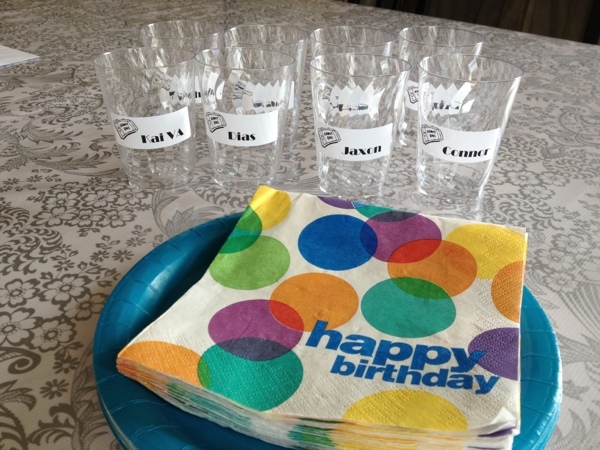 You have a serious knack for party planning. I love the whole idea. Very nostalgic for adults but fun for kids. I’m going to have to make those S’mores for myself. Thanks, Iris! You’re right. It was a very nostalgic event for the grown-ups. Almost all the drive-ins have closed, so it’s extra special to recreate this at home! Sounds like the kind of experience the kids will remember all their lives!